Professor Hilary Downes (Birkbeck College, University of London & President of the Society) presents Prof Johnson with a commemorative certificate.Professor Barrie Johnson of the College of Natural Sciences joins a prestigious list of internationally renowned scientist invited to present the UK Mineralogical Society’s Hallimond Lecture. Prof Johnson is the only academic from Wales to have presented the lecture in the 46 years since its inception, and was nominated and selected by a panel for the Honour. His lecture will be published in due course in the Society’s Journal. With a background in environmental biochemistry, Prof Johnson has gained an international reputation working at the interface between microorganisms and mineralogy. His team carry out research into microorganisms which inhabit extreme environments. The work is relevant to metal mining and to remediating acidic mine drainage and industrial wastewaters. In his lecture, ‘Redox bio-transformations of inorganic species dictate the dynamics of extremely acidic environments’ Prof Johnson talked about his work, showing that some specialised bacteria which live in strong sulfuric acid are able to use, in essence, energy locked up in metals such as copper and manganese by using iron as the key to do this (i.e. they cannot use the energy from these metals directly, but can do indirectly using iron). He explained how this has important implications for biomining operations and associated pollution issues worldwide, as well as potentially the search for life outside of our own planet. The UK Mineralogical Society was founded in 1876 to advance the knowledge of the science of mineralogy and related subjects. 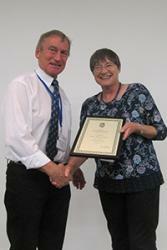 Prof Johnson was also appointed by the Society as a Distinguished Lecturer in 2014-5.